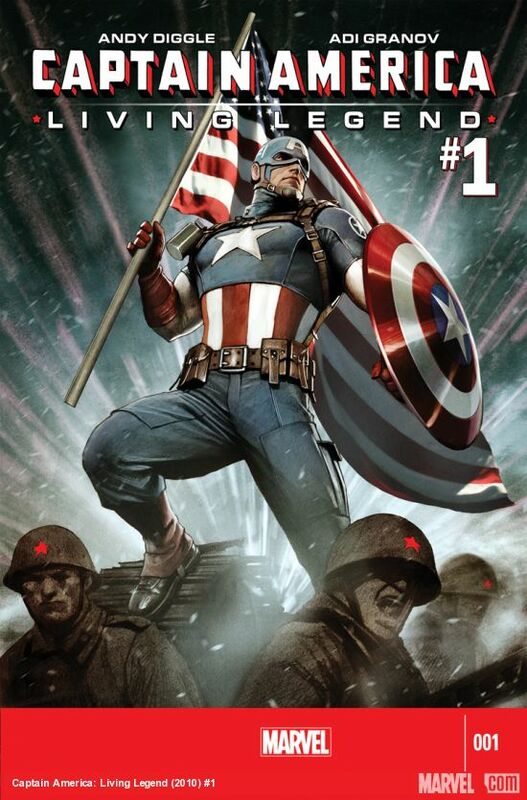 What is Captain America: Living Legend? Well, three years late, is a good place to start. This four part miniseries was supposed to be released in the lead up to the Captain America: The First Avenger (albeit under a different title), and it’s been shelved ever since. Now, with Captain America: The Winter Soldier movie around the corner, I guess they figured the right time is now. I’ve been looking forward to this title for a while, mostly because I dropped Remender’s Captain America on issue 5, not caring for his problematic, pointless, and at times out of character story, or for JRJR’s ugly art. All I was looking for in this book was a decent story and solid art – anything to wipe what’s happening in the character’s current ongoing story from my memory. On this front, Living Legend delivers. It’s not a great title by any means, but it’s engaging and interesting enough to have me looking forward to the next issue. Diggle’s writing is solid, although the story lacks cohesiveness at times, and it’s nice to see Steve back in character again. The story begins in 1945 Germany, skips through Soviet era Siberia, and ends up in the present day. From WWII, to space, and finally the Helicarrier. Much of the start of the issue is taken up introducing the character who will be the main protagonist, and this doesn’t leave a lot of room for Steve, but this isn’t necessarily a bad thing. It’s a good set up for the next three issues, but if #2 doesn’t feature a less disjointed narrative, then the title may be in trouble. The issue is illustrated by the celebrated Adi Granov. He’s best known for ultra-detailed work, and that’s certainly what you can expect here. Fans of Granov’s work will be excited to see a full issue featuring his art. Sadly, I once again found myself decidedly underwhelmed. I have never been a fan of Granov’s, and while I can appreciate the technical skill, I always find it leaving me cold. His lack of expression (and I don’t mean facial) and movement, as well as his characters looking placed in their environments, rather than interacting with them, is something I struggle with. The page design is also uninspiring – although he does take some risks in places, it just doesn’t quite work. Living Legend is also filled with his trademark teeth baring expressions, as well as almost grotesque looking characters. I was also unsurprised to see Sharon Carter looking exactly the same as just about every female character Granov has ever drawn, just with blonde hair. Interestingly, I found the less detailed panels far better. When he takes the focus off creating something photo realistic, his work can really shine. Living Legend is a little bit of a let down, but far, far better than Remender’s current ongoing. The sci-fi element looks like it could pan out to be interesting, and Andy Diggle’s writing is nothing to sneeze at. Those who share my opinion of Adi Granov’s art, may be pleased to hear the rest of the miniseries will be illustrated by Agustin Alessio, so here’s hoping there’s more dynamic movement between panels next issue. Over all, definitely worth a read if you’re a Cap fan, but don’t set your expectations too high.